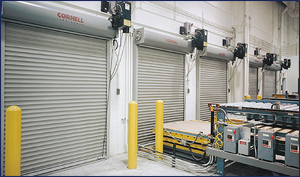 Heavy Duty Rolling Steel Doors, rated and non-rated, designed to fit specific needs, including low initial cost, high cycle usage and extended lift. Slats are hot-rolled steel strips with exclusive GALVANEX finish in light gray, tan or white. Other colors are available with factory powder coating. 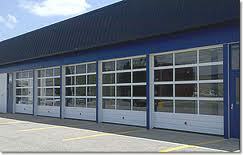 Doors are also available in aluminum and stainless steel and can be insulated. Standard operation is hand chain; motor operation can be included as an alternative. Rated and non-rated shutters. Curtains available in steel, aluminum and stainless steel. Operation is push-up, crank or motor operated. Grilles prevent unauthorized access and discourage forced entry at building exterior openings, store fronts, or areas within buildings such as pharmacies or parts counters. Curtain consists of 5/16" horizontal aluminum rods at 2" centers. Available in aluminum (mill, clear or color anodized finish of alloy 5056 H32). Operations are push-up, hand chain, hand crank and motor. Side folding grilles provide security and access control in openings 12' high with low headroom conditions. Finish may be clear or color anodized with manual push/pull operation. Grille that features a unique curtain comprised of injection molded components and continuous metal rods. Rugged curtain construction will maintain structural integrity and a clean look, even with high cycle use. Available in black or white matte finish. Operation can be push-up, hand crank or motor. Designed to help address both the security and safety issues of public areas. Provides the security of a locked rolling grille but immediately responds in an emergency situation to open automatically and allow safe escape. Sizes for openings 5' to 24' wide and 4' to 20' high. Motor operated to provide fail-safe automatic emergency opening capabilities. Curtain available in aluminum or stainless steel. Doors can be engineered to meet various windload ratings, ratings are listed in pounds per square foot of pressure (PSF). Creating a wind-resistant door involves several changes to the door design. Engineering can be performed in order to meet Miami-Dade County windloading requirements. Standard color: satin white – see color chart for additional colors. Available in 22 pre-finished siliconized polyester paint finishes. Colors available with 20-year warranty against chalking and fading. Springs are engineered to provide optimal balance and have been tested in excess of 100,000 cycles. The smoothest operating corrugated door in the industry. The doors are engineered for frequent use and longevity, offering proven quality and tremendous value. Windloading is available from industry standard up to Miami-Dade hurricane rating. Standard color: satin white – see color chart for additional colors. Guides manufactured from 16 gauge hot-dipped galvanized steel for wood, masonry or steel mounting (optional steel mounting plates required for steel installation). Available in 22 pre-finished polyester paint finishes. Available in sizes up to 16' (4,877 mm) wide and 16' (4,877 mm) high. 2 exterior inside bottom bar locks. Exterior and interior polypropylene wear strips provide smooth, quiet operation and reduce friction. 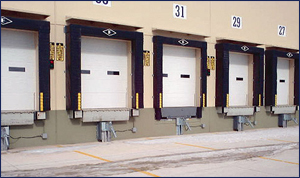 Thick sectional steel ribbed door available in 24 and 20 gauges. Hot dipped galvanized, coated inside and out with epoxy primer and finished with baked-on white or brown polyester top coat for maintenance free performance. Available non-insulated and insulated with many different window options also available. Flush panel insulated doors also available in 1 & 3/8", 1 & ¾", and 2". Aluminum sectional door, 2 & 1/8" thick construction, 6063-TS extruded aluminum alloy with integral reinforcing fin for maximum durability. Standard finishes in high luster clear anodized or pre-painted white or brown to complement most building designs. Available with insulated glass, DSB, Plexiglas, wire glass, tempered glass, polycarbonate and aluminum panel options.